Underneath looks pretty rough, but for $600 could probably part it out for the doors and a few other accessories. 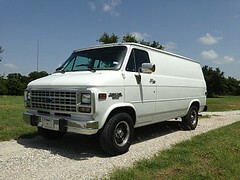 This is one of these vans if somebody is really interested, show up with cash in hand and offer about $400 and go from there. I bet they just want it out of the there. We saw this one before... They haven't sold it yet? I WANT MY $600 DOLLARS !